British Columbia is on the front lines of climate change… From burning forests, melting glaciers and acidic oceans, citizens across Canada’s Pacific coast are living with the realities of climate change, and show what’s at stake if we fail to get BEYOND CLIMATE. Narrated by David Suzuki and shot throughout the province, the collective wisdom of Indigenous leaders, local communities, scientists and policymakers is featured along with imagery of the region’s beautifully rugged landscape. 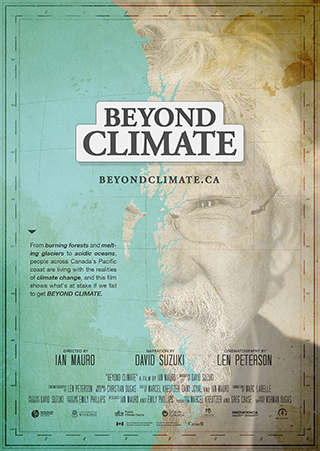 Addressing many of the pressing issues facing BC – from pipelines, LNG, salmon and Indigenous rights – the film is a timely contribution to the province and the country as we grapple with climate change, the paramount issue of our time.